We often talk about Glacier Bay National Park – a particular favorite of ours because it has a concentration of some of the best wildlife and grand scenery in one place, although it’s a very big place! In addition to the ice, mountains and wildlife there’s also an important cultural story to tell about Glacier Bay. 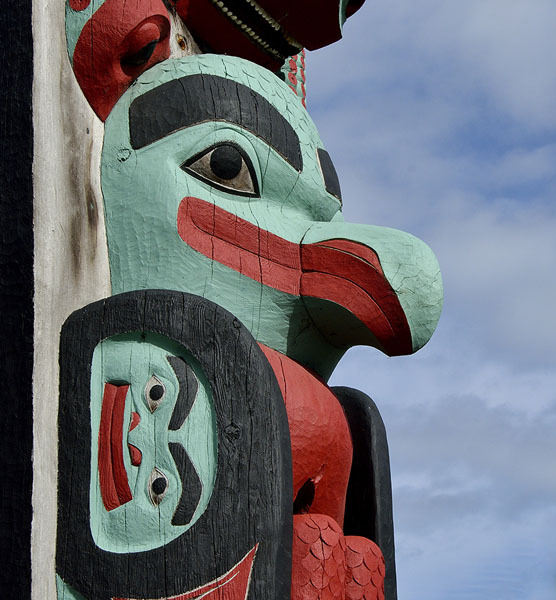 It was home to some of the Tlingit native people for thousands of years until the Little Ice Age occurred around 1750. At that time, the Grand Pacific Glacier rapidly advanced and covered the entire 65-mile long bay, literally pushing the Huna Tlingit off their land. 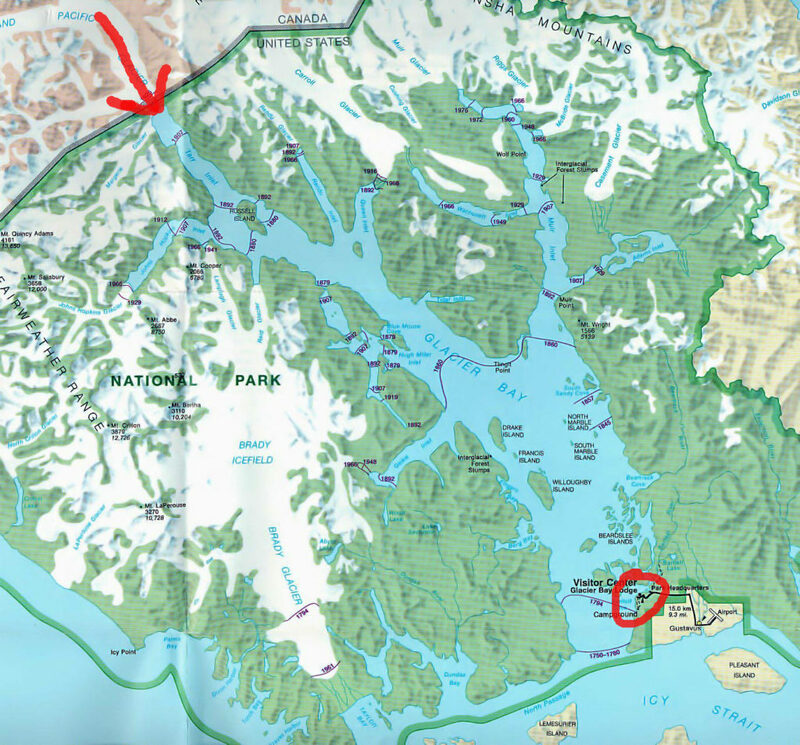 The red arrow shows the current position of the Grand Pacific Glacier – just over the US-Canada border, and the red circle shows the area where the Tlingit villages were located (near the present Park Service headquarters). Imagine the entrance to the bay filled by a massive wall of ice! If you look closely at the map you can see the line where the bay splits into two arms, and that’s the point where the ice had retreated by 1860. 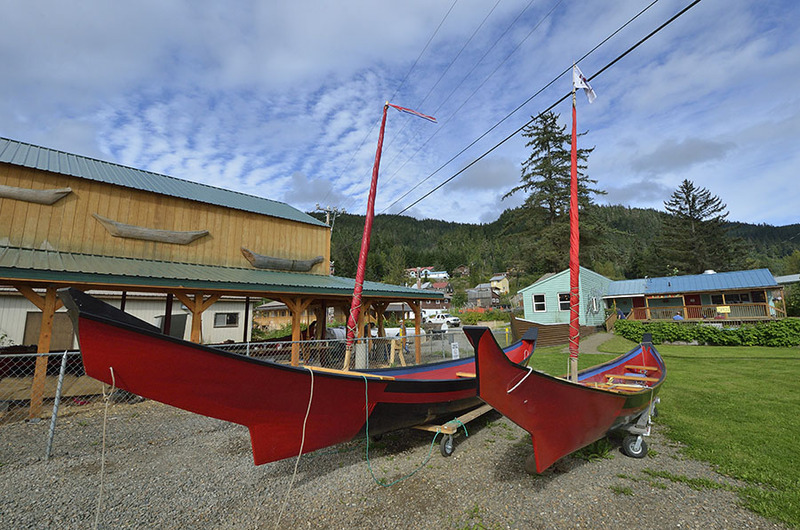 The Huna Tlingit people resettled about 30 miles away in the town of Hoonah, but they have never forgotten their ancestral lands, which had been taken over by the US Park Service. 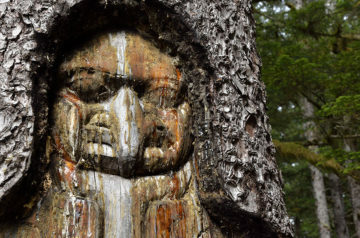 Developing an understanding and changing attitudes took many years, tremendous persistence, and a few different park superintendents before Glacier Bay National Park began to embrace the Huna Tlingit story as a significant aspect of the park. 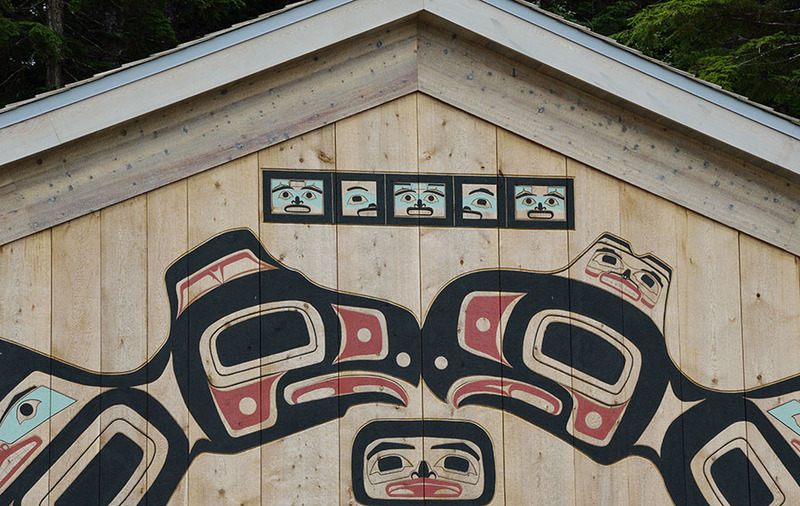 To celebrate the hard-won embracing of the Tlingit’s historic place in the bay, the Park Service and Huna Tlingit embarked on a project to build a Tribal House in Glacier Bay – to provide a place for the tribe to gather for important events, and to share the Tlingit culture with visitors to the park. We’ve been visiting the carvers in Hoonah for the past three years, watching them transform wood panels and logs into huge wall murals and totem poles that depict the two moities (raven and eagle) and the four clans. 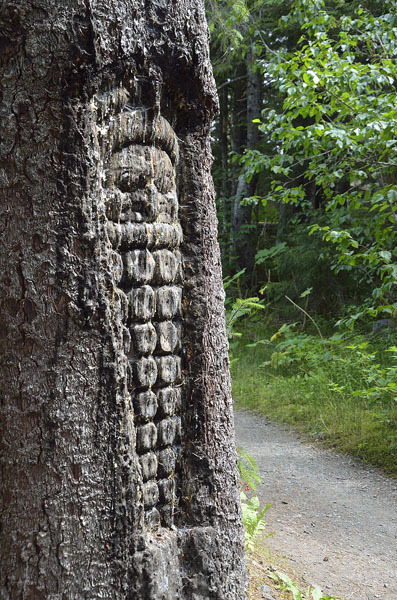 The wall panels were not only designed, carved and painted, but the entire surface has been sealed against the weather by hand – using an adze to close the pores of the wood and push the surface grain downwards to shed rain. Such talent, dedication, and skill! 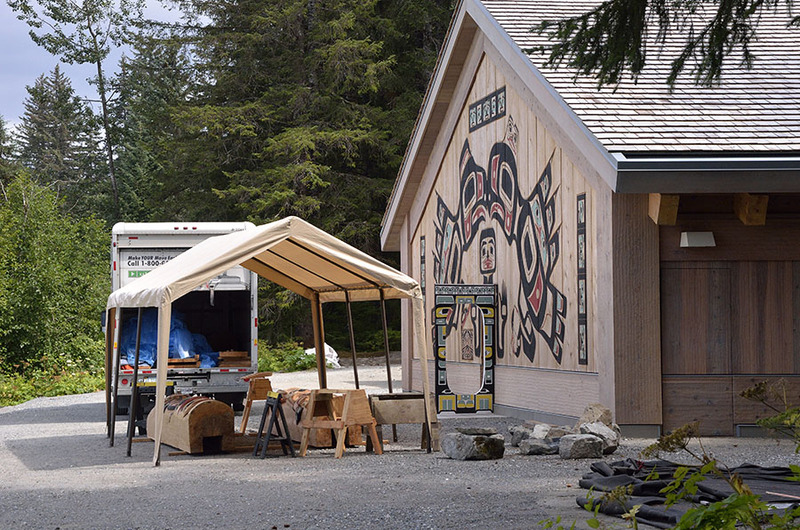 During the four years these carvers worked in Hoonah to create all the pieces for the Tribal House, they welcomed visitors to see their work and were incredibly generous with their time, sharing the story of their clans and of the challenges reaching some understanding with the Park Service. Patience and persistence. The photo above shows the nearly completed Tribal House awaiting the installation of the last two house poles on the inside… in preparation for the Big Event – the formal ceremonies dedicating the Tribal House on August 25, 2016 – on the 100th anniversary of the Park Service. Such a tribal homecoming requires more preparation though. The Huna Tlingit left their lands in log canoes, singing songs of mourning in the 1750s; they wanted to return in log canoes, singing happy songs of celebration. 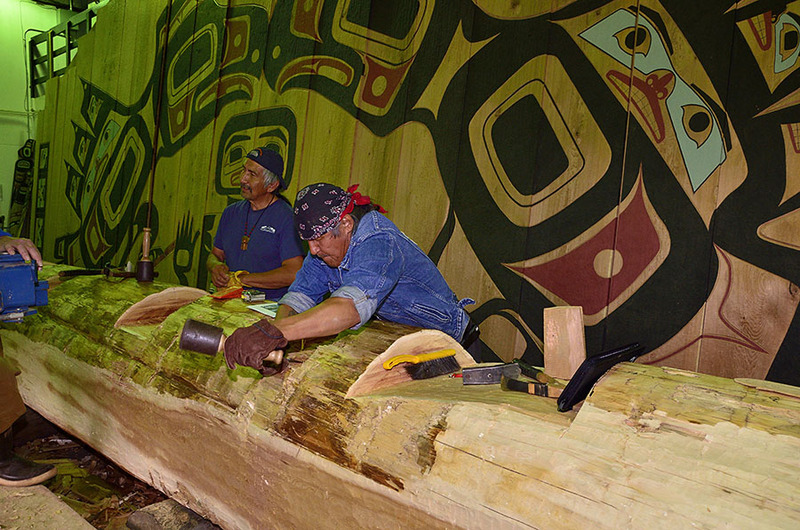 While the house carvers were finishing their work, the canoe carvers were transforming massive Sitka spruce logs into canoes to make the historic journey. 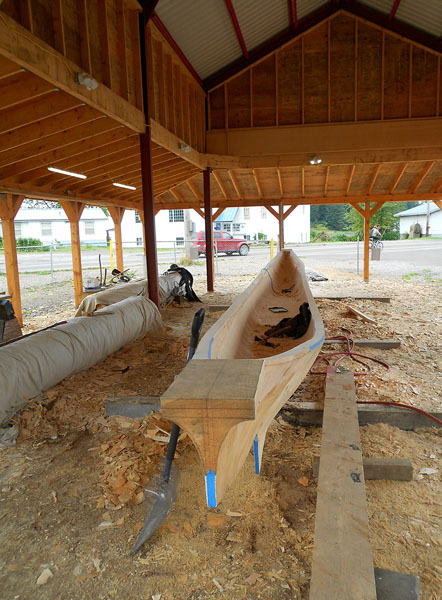 The entire 40′ long canoe was hollowed out by hand using adzes, taking 4-6 months to complete. Notice that the canoe above seems a bit too narrow to be very comfortable or seaworthy. 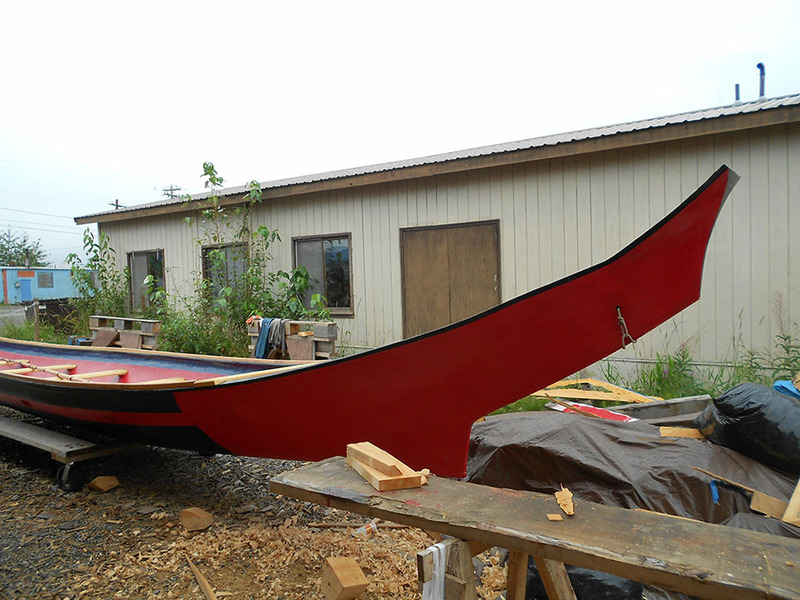 The final step in building the canoe is to carry it down to the water’s edge and fill it with sea water. Large rocks are heated in a blazing fire and placed into the water-filled canoe, heating the water into steam. At the same time, the two sides are wedged apart, gradually steaming the log canoe into a wider shape and causing the ends to rise. The transformation is startling, creating a stable canoe with high ends to throw off the waves. Some canoes are fitted with sails as well. We watched the residents of Hoonah practicing for the long trip to Glacier Bay on our whenever we stopped there throughout the summer. 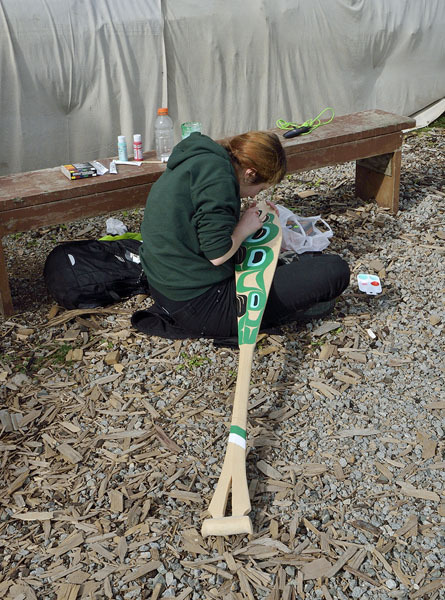 Everyone got involved, and it was fun to watch people making their paddles – each one is a personal reflection of who they are to other people and to the creatures in the sea. The excitement in Hoonah is palpable this summer, and we made sure to get our boater’s permit so we could be in Glacier Bay to witness the Tribal House Dedication. What a beautiful and inspiring story! Thank you for sharing it. Love your photos! Hopefully the bear pics are done with a telephoto HaHa. My house project is finally finished (almost – just 1 small job left). Second observation. I found the graphic of the retreating glaciers informative and worth close study. It seems that a warming trend clearly started before 1800 and continues today. If the trend continues, and the California drought continues along with it, there will likely be another mass dislocation, potentially in the next 20 years. There just won’t be enough water to sustain the usage levels in the state. Actually, there isn’t enough right now.